In April 1918, several calls were made to the Oklahoma City Police Department regarding a concrete mixer at Tenth and Broadway running by itself with no one to tend to it. However, each time a call was made, a motorcycle policeman would investigate only to find no indication the vehicle had even been turned on. Whether these were crank calls or not, the officer had enough and listed in his report that "spooks" were the cause. 9/11 in 2001. The massive national trauma of this event has created reactions ranging from mysterious demolitions of "Building 7" (where everything from gold bars to secret documents were stored allegedly) to believe that a missile, and not a plane, struck the Pentagon. Planet X or Nibiru 2001-2012. A vast government conspiracy has silenced scientists, hidden NASA images, and downplayed the approach of a killer planet and/or star. It was supposed to have come 2003 but now it is set to make an appearance in 2012. End of Time, Dec. 21, 2012. The end of the world according to the Mayan calendar, or the time of the shifting of the Earth's poles bringing global instability via volcanic and tectonic action, and a rare galactic alignment that will spell doom....or, as some suggest, all three! The impact of an immediate media on the investigations of all of these has not been fully explored. Under the stress of getting "something-anything" for the next broadcast, beating out the other outlets, and getting a shot at the big time for a reporter or anchor - well, how much is over-dramatized, glossed over, and misdirected? Add to that understaffed, or prejudiced law enforcement and government, and if the results are slipshod at times, is it any real surprise? The lesson of 9/11 is that agencies have a lot of inbred jealousy of their counterparts and fail to pass things along as a matter of course or to examine things forwarded to them. How much maneuvering for position or prestige was involved in all of these events? How much ego and pride insured crucial voices went unheard or how much low wattage brain power made certain important connections were never made? Had we merely solved that issue....we might have been able to have foregone the creation of a new layer of government in the Department of Homeland Security. Work smarter...not harder....a lesson we can all learn. So, the signpost is up ahead...Oklahoma....just one stop on the Conspiracy Special....a strange train for a strange state. Recently, spammers have been posting comments on this blog. These comments will usually be poorly written and have all the hallmarks of spam-speak. They urge you to "check out" a link included in the comment. I suggest using caution in clicking on any of these links. I doubt Blogger will do much to curb these spammers so, until such a time, it will be up to ourselves to avoid spam. 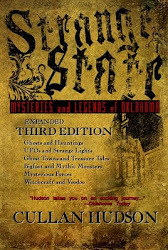 Thank you for visiting and I apologize for any inconvenience this may have caused the readers of Strange State. I will attempt to stay vigilant and delete these spam comments as I find them. In 2000, several police departments across Indiana, Missouri, and Illinois had the same strange experience of tracking a large, silent, triangular shape across the skies. In the late 1990’s Phoenix residents reported seeing large, silent, black triangles in the desert sky as well. The suggested explanations tend to fall on the side of an as-yet undisclosed stealth type craft, perhaps a “stealth blimp.” Top secret craft in development is a lot easier to swallow than a spaceship from another time, place, or dimension (these were also suggested as explanations). The problem is that sightings of such triangular craft are not new. In fact they appear to be much older than first realized and this is what makes them very interesting. They fall outside the accepted “flying saucer” so enmeshed in popular culture and, in fact, were often set aside by early UFO researchers. “Too out there” they'd say. Or these reports did not fit the stereotype accepted by the public. Two luminous triangles were observed against the moon’s surface in July of 1882 (allegedly according to Scientific American, volume 46, pg. 49). In 1955, an CIA file details the launch of a triangle craft from a field with lights at each tip. The APRO Bulletin (Aug, 1955, pg. 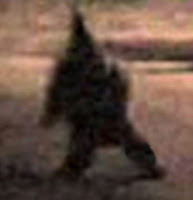 9) lists a March 30 sighting of a silver, triangle shaped object hovering over Wright-Patterson AFB and an Aug 11 sighting near Cairo, Illinois described as “dark, middle part bluish-green, and the back very bright” (author: perhaps due to lights or power source?) . In Sept. 1956 (ibid) there was a sighting near Helena , Montana of a triangle craft. NICAP UFO Investigator reported in Sept-Oct. of 1964 that Robert Briele of Baltimore observed a triangle with lights at each tip and “a small red light in the center” and noted no sound was heard. Youth camping in Maryland in 1968 provided a drawing that could be the mirror image of the craft reported by the 2000 police officers (for info visithttp://dbarkertv.com/UPDATE.htm). Other witnesses to these craft have reported a red light as well. The presence of white lights and a blinking red light would seem to support a craft using FAA regulations as to lights. Maybe ET has to follow the rules too! It would take something very special to remain a top secret military or government aircraft for 50 years! Yet, the presence of such early reports of similar craft is far more compelling than the vast field of look-alike pie tin photos of the same time period. If you throw money up into the air along with a variety of brightly colored confetti – can you be sure that it will be the money that catches the eye? Maybe – maybe – amid the plethora of UFO accounts there has been a consistent thread of sightings related to something very, very real? Maybe a craft triangular in nature? 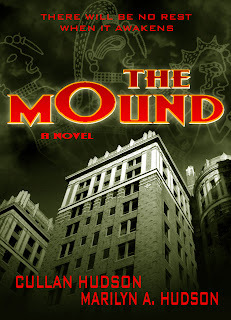 --- Guest Blogger from Spellbound Stories. If you are like me and love the halcyon days of UFO's Golden Age, then you will really appreciate Regan Lee's Vintage UFO blog. By re-examining the accounts that started it all and reacquainting us with the wonderful, often kitschy impact they once had on popular culture, we can briefly return to a time before schitzophrenic paranoid delusions of government conspiracies and just enjoy a good "flying saucer" story or two. If it's a hoax (I believe so) then it is at least funny. Words cannot describe but if you rent "A Christmas Story," you might see a humorous correlation between this video and Ralphie's kid brother. Oh, that? That's just another UFO carrying the ghost of Bigfoot. Like apophenia and pareidolia, some individuals exhibit a tendency to compound-report extraordianary or abnormal phenomena. As far as I can discern, there is not yet a scientific term for this behavior. 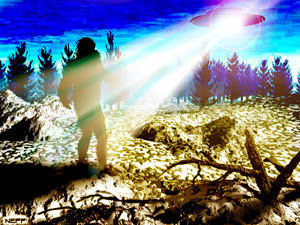 However, we see it often in the realm of paranormal studies when witnesses tell a seemingly outlandish tale involving the presence of multiple disparate anomalies such as UFO's, Ghosts, and Sasquatch - all in the same story. The problem with tales of this type is that credulity is stretched far beyond most people's limits. It is hard enough for many to accept wholly any one of these phenomena, let alone the contemplation that all might exist. But to then ask them to accept that these might co-exist or be related, simply puts too much strain on their willingness to believe. But does this unwillingness to wrap our minds around it translate to saying compound-anomalies do exist? Not without evidence. And time and time again, we have seen that anecdotal evidence is simply insufficient. The absence of proof is not proof of absence, many will say. But, truth be told, for the sake of science, the absence of proof means you need to keep looking. So, when it comes to compound-anomalies, I think it is safe to assume Ockham's Razor applies ten-fold. 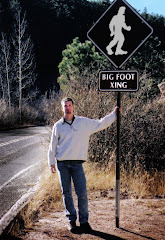 Is this to say that Bigfoot isn't an astral being from another plane of existence with a pet Chupacabras sent to us via a faster-than-light starship? I don't know - but I'm not going to bet on it. Beginning St. Patrick's Day, I shall be offline and on vacation. But fear not! I have a few guest writers who will be popping their heads in and emptying them of God only knows what. I trust it will be an enjoyable time for all. 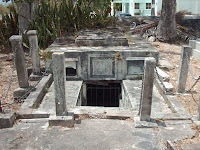 Among my planned stops in the Lesser Antilles of the Caribbean will be Christ Church Vault in Barbados, home to the infamous "moving coffins." So look forward to me penning a few lines and sharing pictures upon my return. A recent Cryptomundo post has me considering another, more fantastic explanation for periodic sightings of lions roaming Oklahoma and other states. 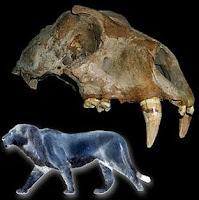 During the Pleistocene, a cousin to the African lion (Panthera leo leo), known as Panthera leo atrox, roamed North America. As with many of its contemporaries (Columbian Mammoth, Ground Sloths, Western Camel...) this feline died out and is only known through the work of paleontologists. But consider for a moment, if you will, the slim possiblity that such a creature could have survived the last Ice Age. Perhaps existing in small enclaves that grow ever smaller with mankind's increasingly pervasive presence. True, it's about as likely as a Paris Hilton Oscar nod, but still completely feasible. These animals existed a mere 40,000 years ago. Many far-older creatures continue to roam the globe. So, why not Panthera leo atrox, the American Lion? Look Who Just Got A Facelift! The Texas Bigfoot Research Conservancy gets a brand new look, and it's all growed up. The new sleek, stylish website eschews the organization's former face of illustrated (slightly goofy) bigfoot images with a subtler, sophisticated facade befitting any serious scientific endeavor. But the fun doesn't stop there. The site also features a new "click on" map of the four states within which the TBRC primarily works: Texas, Arkansas, Missouri, and Oklahoma. The latter inclusion is particularly exciting for myself and probably many of you as well. Despite having so many reported sightings within the Sooner State, Oklahoma has always lacked a proper website to serve as a tool to both investigators and the public. Until such a Oklahoma-based site becomes available, I urge you to check out the TBRC's new face.